Origins and Dispersal of Cultivated Vanilla (Vanilla planifolia Jacks. [Orchidaceae]). Vanilla is a clonally propagated crop originating from Mesoamerica. Information regarding the circumstances under which vanilla cultivation began is incomplete. Presumably, the Totonac people of Papantla (north-central Veracruz, Mexico) were the earliest to cultivate vanilla; however, the oldest reports of vanilla use relate to the pre-Columbian Maya of southeastern Mexico/Central America, where vanilla was a cacao-beverage spice. We utilized Amplified Fragment Length Polymorphism (AFLP) marker diversity to infer the origins and relationships among cultivated and non-cultivated vanilla in Mesoamerica and on islands in the Indian Ocean, which comprise today’s principal production regions of vanilla. 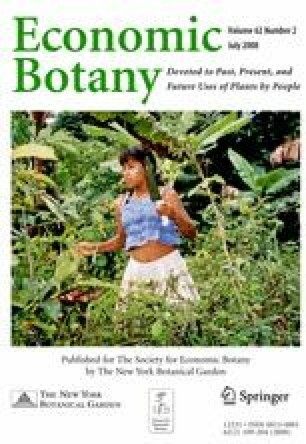 Our results suggest that, genetically, vanilla cultivated outside of Mesoamerica is most closely related to cultivated stock from Papantla; whereas unique clones of V. planifolia are found in non-cultivated and cultivated individuals from elsewhere in Mesoamerica. This is consistent with a single origin for cultivated vanilla outside of Mexico, along with multiple origins for cultivated material within Mexico. These data suggest that vestiges of pre-Columbian Maya vanilla cultivars are not found in commercial production today. Earlier versions of this manuscript benefited from editorial comments by M. Roose, J. G. Waines, and two anonymous reviewers. M. A. Soto Arenas played a crucial advisory role in the initial phases of this research, especially in helping locate putative populations of wild vanilla in Mexico. Generous financial support was provided to P. Lubinsky from a NSF Graduate Research Fellowship, a UC-MEXUS doctoral grant, and the Department of Botany and Plant Sciences at UC Riverside. FAOSTAT (Food and Agriculture Organization of the United Nations). http://faostat.fao.org/ April 30, 2008.